Salt Ponds Coalition is proud to be the oldest continuously operating volunteer marine water quality monitoring program in the nation! First and foremost, we sincerely thank our many intrepid pond watchers—without their dedicated efforts every two weeks from mid-May through mid-October, on lovely mornings and also not-so-lovely mornings, we would not have this important long-term and thorough data record on our salt ponds. We also offer our deep gratitude to our generous members who support our water quality testing program by sponsoring sampling sites, which cost $600 per sampling site per year in laboratory fees. Salt Ponds Coalition is the only organization collecting these important data every year, year after year. Having a long-term dataset is critical to monitoring water quality trends in the ponds and spotting potential problems that may be brewing. Our database is extensive! Salt Ponds Coalition has two water quality databases: one containing older Pond Watcher data (almost 24,000 data points) collected from 1985 through 1994, and the other storing more recent Salt Ponds Coalitions data (over 29,000 data points and growing every year) collected from 2000 – present. Data collected during the current sampling season will be added to our database sometime the following spring or summer, after all data are analyzed, processed, and quality assured. All of our water quality observations are recorded or analyzed either by the volunteer water quality monitor (dissolved oxygen, temperature, and Secchi depth data) or by the staff at the University of Rhode Island’s Watershed Watch (URI WW) program (bacteria, chlorophyll-a, and nutrient samples). At URI WW, all data, including field observations, are entered into Excel spreadsheets and undergo quality assurance. Once URI sends the spreadsheets to Salt Ponds Coalition, they undergo even more quality assurance and are imported into a Microsoft Access database. Salt Ponds Coalition has developed database reporting software to automatically produce hundreds of PDF files which present our data. Each PDF file is a one page report with a table and a bar chart showing all data for a particular sampling parameter (dissolved oxygen, nitrate, ammonia, etc.) for a particular site (surface and deep for some sites) for every year the site was monitored. Thus far, there are almost 1,300 of these files available online, not including the older Pond Watcher data! Anyone can access these reports by clicking on the maps to the right of this text, then scrolling down to agree to our data use terms. The two Google maps link you to the two datasets mentioned above: the first is for accessing the older Pond Watcher data, and the second is for accessing the newer Salt Ponds Coalition data. Each marker on the maps represents a sampling location. Clicking on a marker displays links to the data reports. Salt Ponds Coalition is proud to make our data available for use by policy-makers, scientists, students, and of course, the public. With the continued support of our members, we look forward to continuing to build this valuable resource for everyone interested in the health of the ponds. SPC's water monitoring program is sponsored in part by the RI Rivers Council. 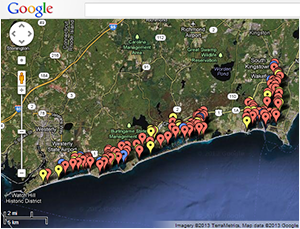 Click here to visit the University of Rhode Island Watershed Watch Web Site. 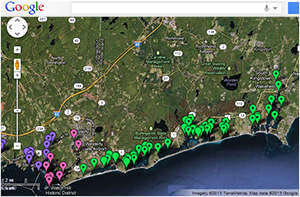 Click here to go to view Aquatic Health Index summary reports for each salt pond. Click here to read an SPC newsletter (The Tidal Page) article describing our water quality monitoring program in more depth, with graphics.